Last night my sweet husband asked me what I’d like for Mother’s Day. I glanced at the calendar and realized that it’s this Sunday! I can’t believe Mother’s Day is almost here. So for all of the hubbies out there who are searching for that perfect gift here are a few Bible journaling gift ideas for Mothers Day. Scroll down to the bottom for my favorite idea. The affiliate links in this post help support our ministry with a small commission. There is no additional cost to you. Thank you for your support! Remember when you were young and you used to write the sweetest love letters? Yes…years ago. Those still work! Put your thoughts on paper, make a card (no it doesn’t need to be as good as the ones you see her make), frame a picture, put some non-toxic paint of your kid’s hand and make a print. The list is endless. I love collecting and journaling in a new creative Bible. The newest Bible journal released on February 1, 2017, and is the first paraphrased creative Bible on the market. It’s called The Message Canvas Bible: Coloring and Journaling the Story of God by Eugene H. Peterson. The publisher is NavPress. It is simply a stunning Bible, and I should be getting one to review soon. When buying a Bible, make sure you purchase a translation that she’ll like. The Message is more of a story as opposed to a word-for-word or thought-for-thought translation. However, the art in this Bible is enough to get anyone diving into the Word! There are many other creative Bibles on the market, so feel free to use our Bible Journal selection tool to find one that best suits your gifting needs. The other two creative Bibles that are on my list are the KJV Creative Bible and the MEV Promises of God Bible. I think the best part of this book is all of the stickers and elements provided in the back of the book. Those alone are worth at least three times what the publisher is charging. To see my in-depth review of this Book, click here. Dayspring sells kits by Illustrated Faith every month. The latest one is Doodles to Live by. It’s simply an adorable kit. If you want that kit or any of the fun Illustrated Faith stickers and stamp sets, you’ll need to choose next day shipping and purchase your gifts by noon on Thursday. For those starting out, The Starter kit by Illustrated Faith makes a great gift as well as the Genesis kit. If your budget is limited, I would recommend purchasing a journaling Bible and a few coloring pencils. I added a few stamps to my wish list. 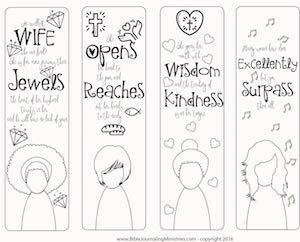 There are so many new Bible journaling stamp sets on the market these days. Spellbinders just released an entire set by Joanne Fink. It’s definitely on my list! Also on my list are these cute Angel stamps by The Greeting Farm. Geez, it doesn’t get much cuter than that. If you buy stamps, remember you need a clear block, ink and gesso to reduce bleed through. 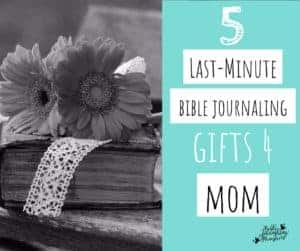 I could go on for days listing all of my favorite Bible journaling gift ideas for Mothers Day. But, then we’d be passed Sunday so I’d better stop here. Remember that the BEST Mother’s Day present has already been given to the one you love. And that is our Lord and Savior, Jesus Christ. The Best Bible journaling gift ideas for Mothers Day is simply that.